The RAF Signals Museum at RAF Henlow is an excellent collection of military communications equipment which is expanding to cover the period from before WWI to the more recent past. More details can be found on their web site. 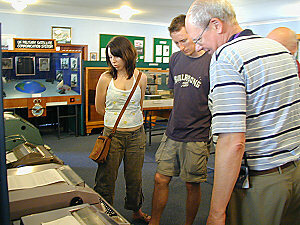 I visited the museum in June 2005 during the Museums on the Air weekend. 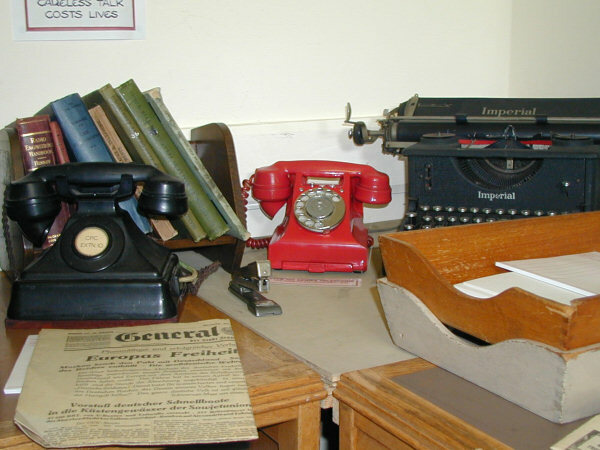 Although the collection includes much radio and radar equipment, my main interest was in the telephony and telegraphy equipment. I took plenty of photographs, but can only present a selection here. I've passed copies to the museum staff and hope that they can use some of them either in displays or on their web pages. I visited again in 2009 by prior arrangement. 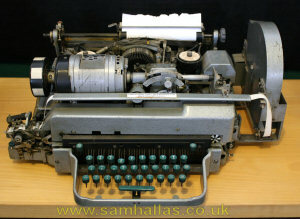 I took some more detailed shots of the teleprinters, some of which are included here. The museum staff are very helpful and spent time explaining the exhibits to all the visitors. Although the space available is limited, there is an awful lot of stuff crammed in with very informative descriptions. Let's start the tour with some of the WWI items. 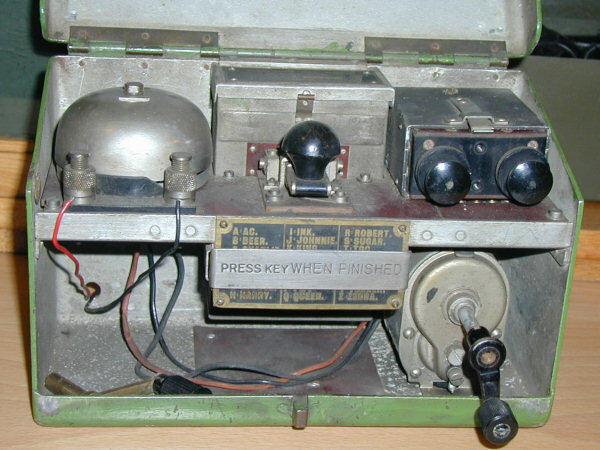 This is the Observer Telephone for use by the Observer Corps in forward observation posts. 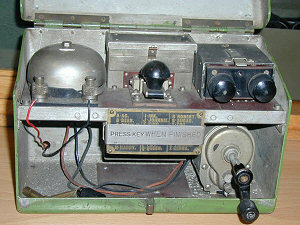 The headset and breast plate transmitter stow away neatly into the case, slightly obscuring the magneto handle. The instructions inside the lid show how to fold the headset up to make it fit and also contain the phonetic alphabet of the period. 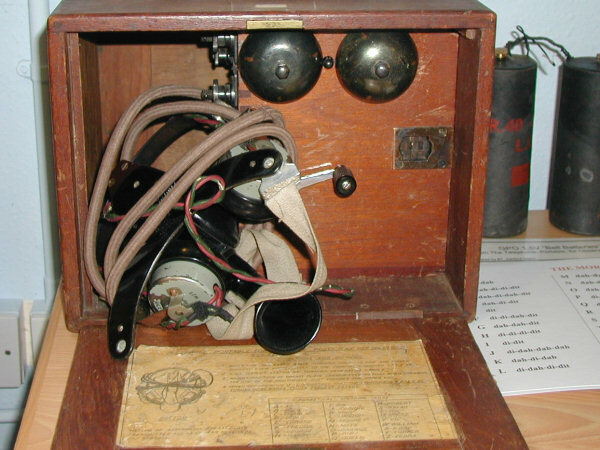 The Fullerphone was a portable DC line telegraph invented during WWI to prevent the enemy eavesdropping on communications in the trenches. See Louis Meulstee's web site for a detailed explanation of why it was a major factor in the Allied victory. In a side room the museum has re-created a Y-station that gathered signals intelligence during WWII, complete with period newspapers. 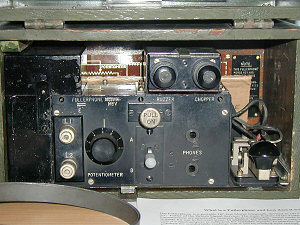 A field telephone type D. In use during WWII, though superseded later by the more familiar Type F.
On now to the teleprinter display. You can see from left to right a Creed Envoy, a Creed 444, a Siemens T100, a Lorenz LO15, and right at the end two Creed model 7s. Creed's Model 444 was used by the GPO in the Telex service as PO Model No 15. 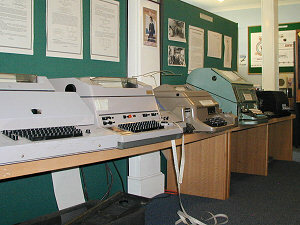 Siemens T100 saw service with many armed forces round the world from the 1960s onwards. 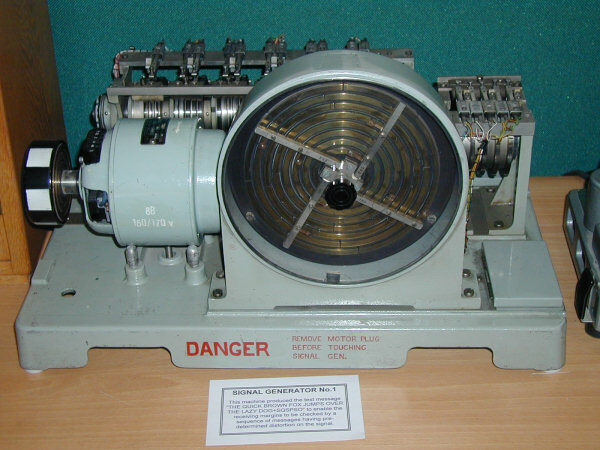 It's predecessor was the Lorenz LO15. 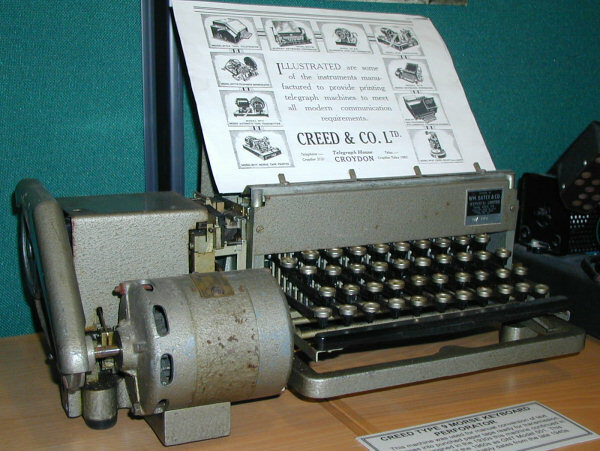 The Creed Model 7 is displayed without its silence cover so you can see the works in all their glory. 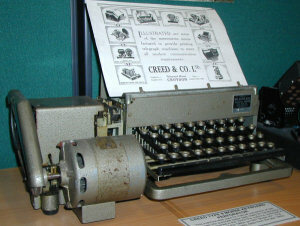 The Creed Model 7 range was very versatile. Here's a version that can print out a received message and punch a fresh tape copy at the same time. And this is a model for preparing paper tape for transmission. 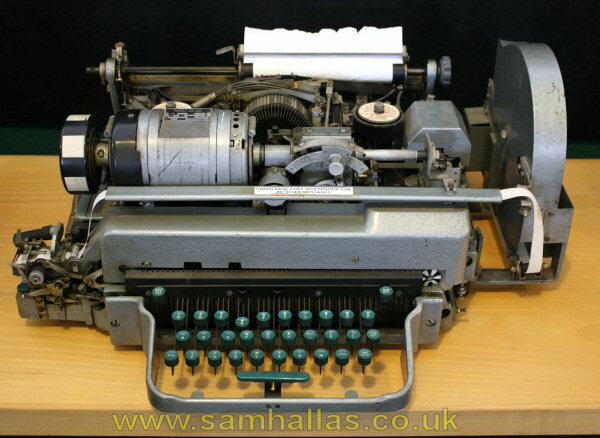 There's no printed copy provided so the operator has to be an accurate typist. There's a little light on the right hand side to warn when it's time to start a fresh line. 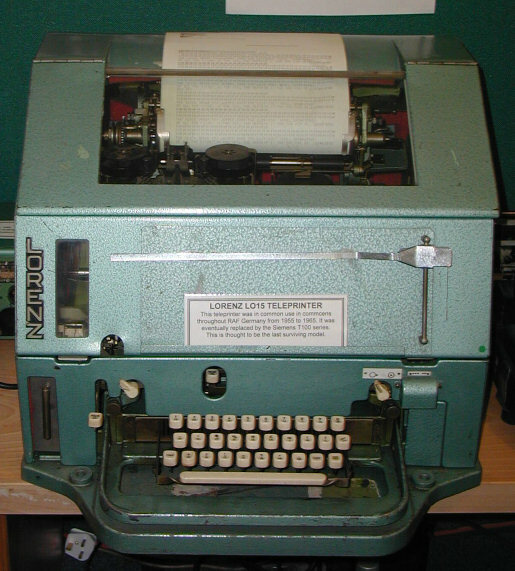 This version prints directly on to paper tape, which would typically have been gummed for sticking onto a telegram form. 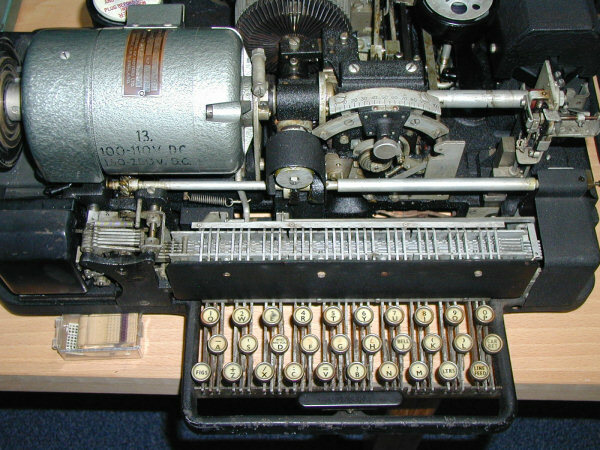 The Model 7 range did not include any means of sending messages from tape. 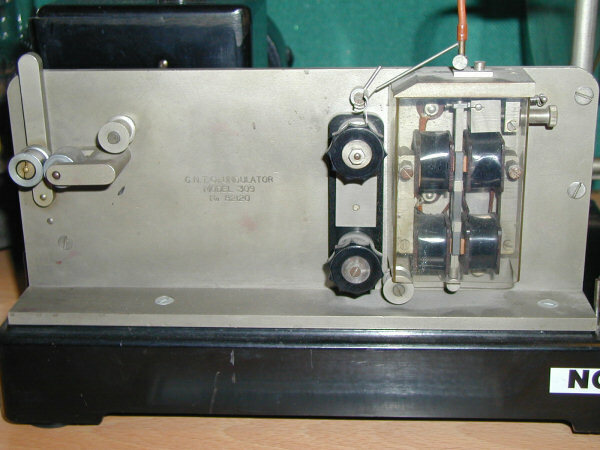 This task was performed by the Model 6S tape reader. 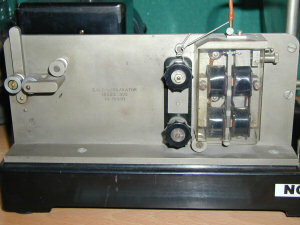 Tape is fed in from the right hand side. 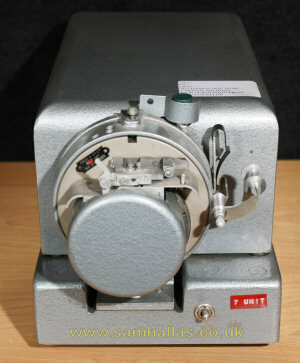 The roller with the handle on the end keeps it in tension and can signal to the control circuits when the tape runs out. The tape passes under the clamp structure in the centre. The holes are read by small rods called peckers which press against the tape. Where there is a hole they pass through. 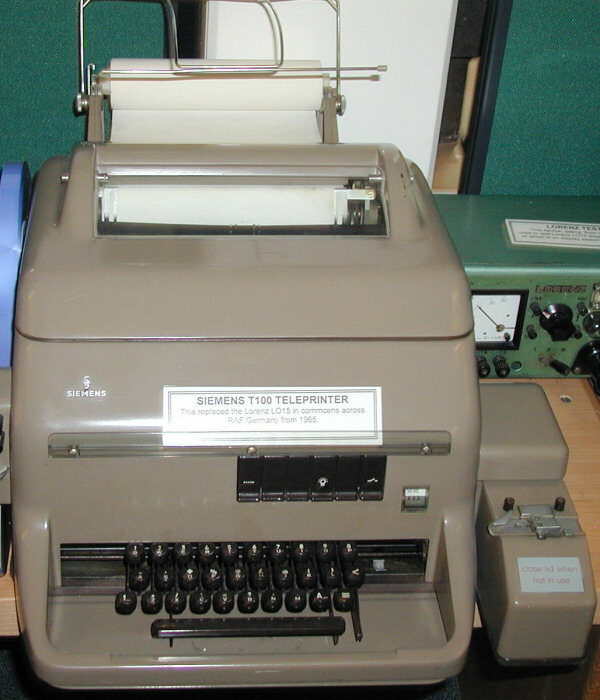 Creed's Model 444 was used by the GPO in the Telex service as PO Model No 15. 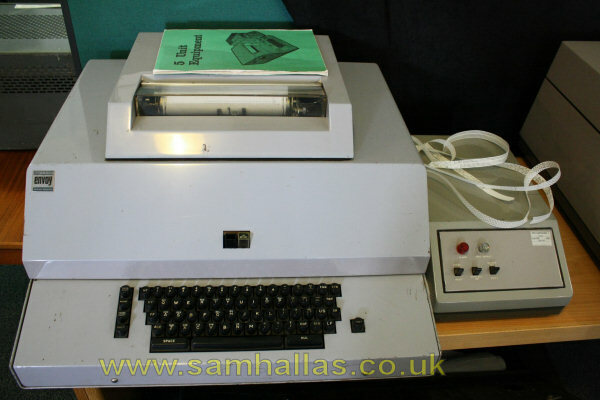 By the time this model was designed all the functions were incorporated into one machine - printing, reading and punching tape. 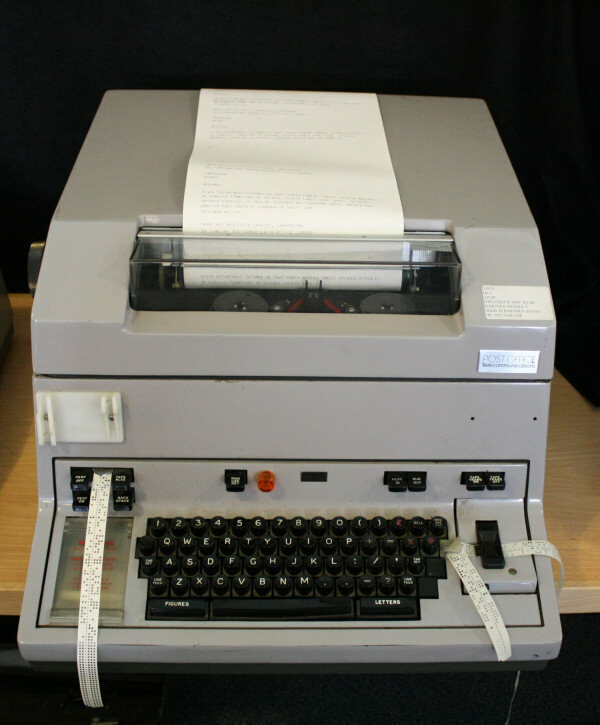 The Envoy is similar to the adjacent 444, but handled 8-unit code. 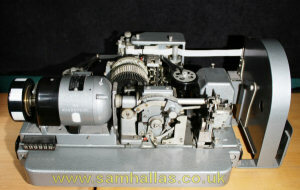 One of the more unusual items is this GNT undulator, which is a device for marking received Morse code onto paper tape. It has a siphon tube which transfers the ink (top right) to the paper which feeds in from the bottom right over the metal roller and round the inking mechanism at the top. The ink is controlled by the magnets inside the Perspex cover. The tape then passes on to the capstan assembly on the left which pulls it through. 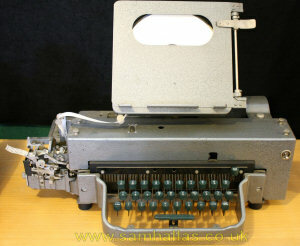 Another less common item is this Morse keyboard perforator from Creed. A particularly rare machine is this mechanical signal generator which produces a 'QUICK BROWN FOX' message with variable distortion for use in aligning teleprinters. 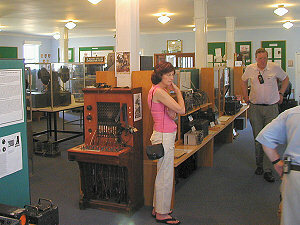 A previous owner had stripped the wiring out, but the museum staff hope to get it working again eventually. Collection: RAF Signals Museum, Henlow. Pictures © 2005 & 2009 Sam Hallas.